In the J Kerker Quinn papers in the Rare Book & Manuscript Library at the University of Illinois, Urbana-Champaign, there is a mini treasure trove of Sylvia Plath archival materials. 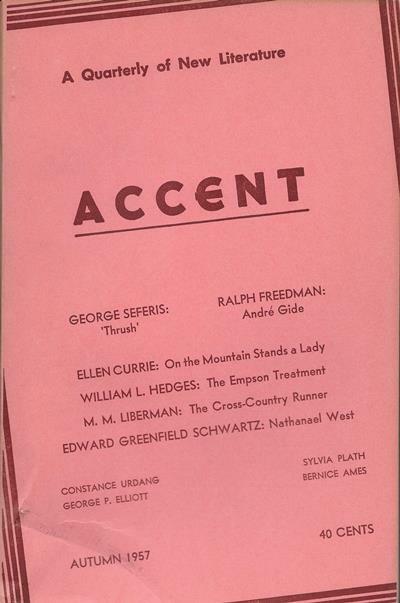 Quinn was the editor of the journal Accent, which published two poems ("Recantation" and "Tinker Jack and the Tidy Wives") by Plath in their Autumn 1957 issue. In the Quinn papers there are two undated letters from Plath to the Poetry Editor; five typescript poems ("The Eye-Mote"; "The Thin People"; "Landowners"; "Maudlin"; and "Green Rock, Winthrop Bay"); and a typescript of her short story "Johnny Panic and the Bible of Dreams". Additional materials in the papers include reader report comments on Plath's submissions. The undated letters from Plath can be roughly dated to circa 5 April 1957 and 1 July 1959. This is based on the date received that was marked down on the reader reports for Accent. The 1957 letter had a return address of 55 Eltisley Avenue in Cambridge. This letter Plath says she's enclosing several poems for their consideration. She states that her poems to that point had appeared in the following magazines: The Antioch Review, The Atlantic Monthly, Harper's, The Nation, Lyric, Mademoiselle, and Poetry (Chicago), among others. Ever courteous in business matter, Plath thanked them for their time in considering her poems. We know two of the poems were "Recantation" and "Tinker Jack and the Tidy Wives" as they were printed in the autumn of that year. The poems were accepted on 23 April 1957. The readers of the poems found them "interesting", a little "thick", and "Yeatsian." The comments indicated that the poems needed some revision, but what these suggestions were is not stated. it was ultimately deemed that the poems were "worth it". There is no accompanying letter, but Plath submitted her story "Johnny Panic and the Bible of Dreams" which was received by the magazine on 25 February 1959. The story was not accepted and as you might expect, the readers comments were mixed: slow to get started but a "creepy thing" by the end. One reviewer objected to the tone of the piece, not liking the jokes and sound effects which Plath made and employed. That being said, the story did grab one readers attention. Another editor of Accent at the time, Daniel Curley, also has his papers at the University of Illinois, Urbana-Champaign. However, sadly, a search through the appropriate boxes and folders found no Plath items in them. Daniel Curley, irony of ironies, appears in Plath's address book (housed at Smith College) but J Kerker Quinn does not. Go figure. My deepest appreciation to Curator Anna Chen and Cara Setsu Bertram, the Visiting Archival Operations and Reference Specialist, at the University Archives of the University of Illinois at Urbana-Champaign for their assistance, time, and patience with my requests for information. You can see more libraries that hold Plath materials on the Archival Materials page of my website for Sylvia Plath, A celebration, this is.